Despite, that we live in an age of information and network technology, they are not able to completely rid us of the work. Sometimes a person still have to leave the house, to get the desired result. This article will consider, how to fill a registered letter, and discuss small details and pitfalls. Before, how to deal with the letter himself, decide, that will be sent in addition to his destination. If it's just a piece of paper, contains text, the recipient does not need any receipts and receipts. Typically, such letters are congratulatory or personal in nature, it may be an ordinary card, or little message about your life. It is important to know, that mail puts weight restrictions, since an above 20 gram will be sent to an additional condition for payment. Besides, worth mentioning, not to put the money in an envelope, credit cards, valuable documents etc.. objects. Do not forget to specify the exact address of the recipient, otherwise the parcel will not reach the final place, and come back to you. Question, how to fill out an, I have already been discussed on our website in the article about, how to send. Here we will do this in more detail, as well as answer all your questions. In that case, If you want to send important documents or valuable documents, the premise must be taken to guarantee. To do this, the recipient must fill out a receipt after receipt and put his signature. There are weight limits – after 100 gram you have to pay extra, tk. the parcel will be equated to the parcel. It is important to know, if you are worried about the safety of the contents of parcels, you can fill in the description of contents, and ask for acknowledgment of receipt of the letter by the addressee. so, we dealt with the, what kinds of writing there, We talked about the basic things, Now touch on the issue, concerning the filling of the envelope. All fields must be filled with a paste. And be sure to use Russian characters in the case of sending a letter to the Russian Federation. With international parcel data to be filled in Latin letters and Arabic numerals. Note the lower right corner, Here you must specify the destination address. Next, move the view in the upper left corner and select the place of dispatch. Write legibly without abbreviations. 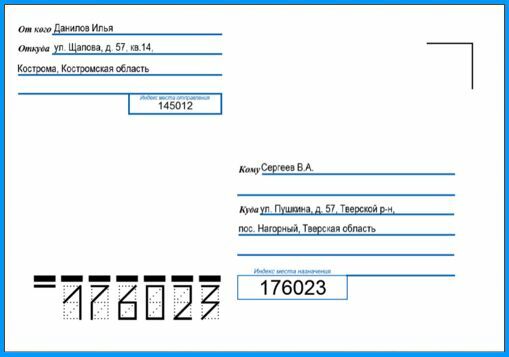 In more detail with the structure of the letter can be found on the official website of the Russian-MAIL. There you can find all the indexes and the destination. Home address (Street, house, apartment, city, district, country). use tips, published in this article, then the question, how to fill in a registered letter, you will not worry.